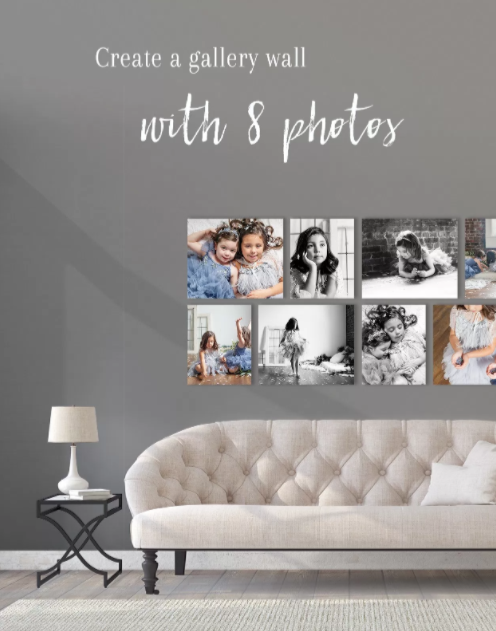 I kick started this wall gallery series with How to Display Photographs in Your Bathroom, but we’re headed somewhere more normal this week: the living room! Or anywhere with a large wall space, really. The larger the wall, the larger your images should be to keep them from looking out of scale. And when you have a very large, empty wall, you can fill it with a larger number of pieces, too. Today, I’m showing you a display that includes 8 images. This is perfect when you have a story-telling photoshoot you’d like to share, or a large family with a variety of groupings. Recognize this photoshoot? Check out the full gallery + behind the scenes video here! Or go for a smaller version and use (4) 12″ x 16″ vertical images and (4) 16″ x 20″ horizontal images. There should be a minimum of 6″ between the top of your couch and the bottom of the first photograph. Is this in a lounge-y room, where people lean their heads back? Then grab your tallest family member and ask them to sprawl out. Mark on the wall lightly to indicate where the top of their head hits, and be sure to hang the photos above that point. 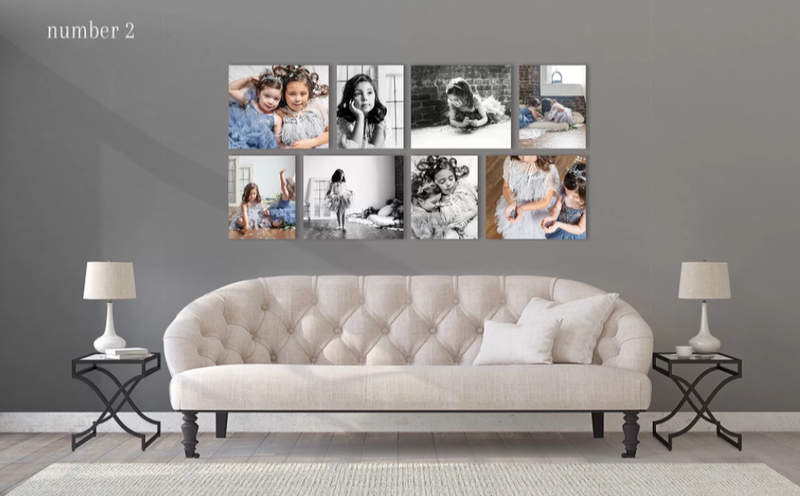 Nobody wants to bump their photos off the wall, so make sure that won’t be an issue! Your 8 photographs don’t have to be all in color or all in black and white – mix it up! To keep things from looking hectic, balance the color photos equally throughout the wall gallery. In my example, the color photos are all on the outside, while the black and white ones are all on in the inside.